​You feel dismayed and confused by your behaviour. 'Why can’t I just eat one?' you wonder. You are sure that no one else seems to fall into an anxious frenzy of wishing to devour more biscuits, plus crisps, pizza and cake too, all simply triggered by allowing that first morsel to cross your lips. Why oh why do you feel so compelled to just keep eating? Everything had been going so well. You were following your plan to the letter and it had felt manageable; different this time. But suddenly, you feel propelled back to square one and that your diligent efforts have been ruined. You berate yourself accordingly and feel hopeless and despondent. Why not just carry on eating and have a proper blow out? You can always start again tomorrow. Once the decision has been made, it feels like there is no going back. You want the food now; quickly and to get as far away from everyone as possible. As your colleague chats to you, you tune out; you can’t focus on anything else but thoughts around food. If you recognise yourself here, you may feel trapped and hopeless about breaking free from ‘I’ve blown it thinking’. For ‘I’ve blown it thinking’ to exist in the first place, you no doubt have some rules around your eating that you are trying to adhere to. Said rules might dictate calories to be eaten or food types to be allowed or not. You may feel that you have a imaginary fence around you that clearly marks ‘safe and controlled food territory’ compared to ‘non-safe, out of control, chaotic wilderness’ beyond the fence. Everything might feel blissfully fine and ordered when you stay on the safe side. However, when you cross the fence, even briefly, your order and control might dissipate rapidly, as you chastise yourself for having broken a much valued dietary rule. If you allow your fence to be less rigid in the first place and to permit some flexibility now and then, you are more likely to be able to manage rule breaking with a clearer perspective without getting overwhelmed. It is slightly remarkable to think that you have over 60,000 thoughts per day and many of these are repetitive. Already, you may begin to contemplate the potential for your thinking patterns to affect your day. If you think ‘I’ve blown it, so I’m a greedy, good for nothing’ – think about how you are going to feel. There could potentially be some judgement attached to this thought, implying either success or failure of an action. You may possibly feel quite anxious, stressed and unhappy in response to this. So think about how you talk to yourself. How can you be kinder; more rational and realistic about your eating behaviour? If your blood sugar is low before you eat the culprit food that breaks your dietary rule, then you are more susceptible to getting a sugar and endorphin ‘hit’ accompanied with a unbridled desire to eat more; this can feel like an addiction. Keeping your blood sugars stable throughout the day is an effective way to help manage cravings and also to reduce the physiological ‘benefit’ of overeating. Eating at regular intervals and ensuring you have enough protein, good fats and slow release carbohydrates throughout the day, can really help you manage the desire to eat more. When you are feeling compelled to go on an eating frenzy, now is the time to take time out. If possible, stop, pause, relax and distract yourself for a while. The urge to binge is like a wave and it will rise and fall. You can learn to ride the wave and come down the other side of it. After the pause, if you recognise that you are genuinely hungry for food, allow yourself to eat something nourishing and filling. If you distinguish that you are craving food that isn't related to hunger, try and identify what it is that you need. Is it some fresh air; a walk; time out; relaxation; distraction; some calm? Remember that eating cannot solve these other problems sustainably for you. Eating a few biscuits might be pleasurable, enjoyable and tasty. But eating to the point where you feel physically uncomfortable can be very self-punishing and destructive. If you are able to, stand back and think about the bigger picture. How are you going to feel in an hour’s time if you turn to food? How can you treat your body well and look after it? Self-care and self-destructiveness are not usually mutually compatible. Opt for the self-care even when you don’t feel like doing it. Trust that treating yourself with love and respect will get you back on track and help filter in feelings of calm and contentment. 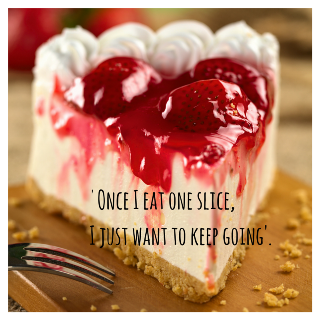 If ‘I’ve blown it eating’ is taking over your life and you desperately wish to find a way out of this struggle and develop a healthier relationship with food, then you might want to consider getting some support through counselling.